This is the fifth book in the series featuring Detective Chief Inspector John Crow. 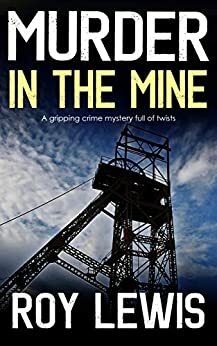 I have read, reviewed and thoroughly enjoyed the previous four books and I had high hopes for ‘Murder In The Mine’. I was not to be disappointed as I absolutely loved it but more about that in a bit. Detective Chief Inspector John Crow is a bit of a funny old fish. He works in the Met and he is considered to be brilliant at what he does but he isn’t exactly a people person. Crow has a way with words. ‘Murder In The Mine’ sees Crow called in to help the police in Wales to investigate the case of a woman found dead down a mine shaft. Crow isn’t exactly thrilled to be sent to Wales and the police in Wales are not especially pleased to see him. There’s a certain degree of hostility and animosity between the two parties. Crow says what he thinks and he doesn’t suffer fools gladly. He doesn’t seem to care whose toes he treads on. Crow can be blunt and he certainly doesn’t beat around the bush. It isn’t long before Crow makes headway in the case. Who is the woman down the mine shaft? Who is the killer? Why did they kill the woman? Will Crow solve the case? Well for the answers to those questions and more you are just going to have to read the book for yourselves to find out as I am not going to tell you. ‘Murder In the Mine’ appealed to me in a few different ways. Firstly, I have a huge history in coal mining, which is due in part to my family tree. Life has always been the pits for my family- well at least 6 generations thereof anyway. Secondly, I love the DCI Crow series because it transports me back in time to an era that fascinates me and I love Crow’s bluntness and his brilliant investigative brain. Thirdly, I love the fact that the North East of England appears in the story, although I didn’t realise that until I had got part way through the book. I’m from the North East and I love books that names places with which I am familiar. It didn’t take me long at all to get into this book. Pretty much by the time I got to the bottom of the page, I just knew that this was one book which I would be binge reading and so it proved to be. I managed to read over a quarter of the book in one sitting without having to move, which is blooming good for me. Usually I have the attention span of a gnat and I am easily distracted but not in this case. The chapters are rather long in length but I was so taken by the storylines, the characters and the author’s writing style that I didn’t notice how long the chapters were taking me to read if that makes sense? Reading this book became addictive and if I had to put the book down then I was counting down the time until I could pick the book up again. I seemed to race through the book and I had mixed feelings about finishing the book. Don’t get me wrong I was pleased to finish the book because I knew how the case ended but I was enjoying the book so much that I just wanted it to continue. The DCI Crow series is set during the late Sixties and early Seventies when attitudes were different. A couple of times I winced at the terminology that certain characters use but then I told myself that I was judging the terms from a 2019 perspective. For me ‘Murder In The Mine’ is very well written and cleverly plotted. The author has a writing style that is easy to engage with and he certainly kept my interest all the way through the story. I was gripped by the story and at times I was on the edge of my seat. There were several twists and turns during this book- some of which I was expecting and some of which surprised me. I even found that I was interacting with the book. Yes I know this is a work of fiction but I find that if I really, really enjoy a book, then I tend to ‘live’ the story as if it was real. I even found myself suggesting tips or ideas to Crow then I realised that he didn’t exactly need them since he is an ace detective himself. In short, I loved reading this book and for me, ‘Murder In The Mine’ is easily the best book of the series so far. The DCI John Crow series just keeps getting better and better. I can’t wait to read the next book in the series. Here’s hoping that I don’t have too long to wait. I would definitely recommend this author and this series to other readers. The score on the Ginger Book Geek board is a very well deserved 5* out of 5*.